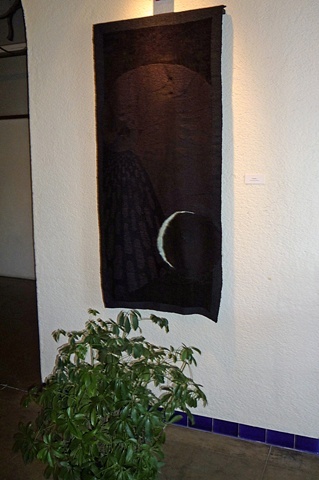 Folding Space, conveys the wonder of space through the recurrence of universal forms and the use of black yarns. The design was inspired by a NASA photograph of the planet Uranus taken by Voyager 2 as well as the watercolor of the Black Widow Iris completed by Meria Sybylla Merian in 1700. The potential and unlimited possibilities of space are felt as orbits of golden spirals radiate outward from the planet. Space continues to expand as it pushed against the woven frame. Uranus’ many moons orbit the planet in Fibonacci patterns.